Blogs, Resources, Tips, & More! 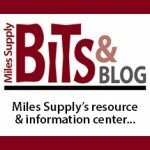 It’s very new to Miles Supply to have a blog! It will be a way to keep our information fresh and updated. We intend to also put video and tips & tricks in here – so keep on coming back. You will be able to search around our blog under categories, too. But if it’s new to us, it’s new and strange to you – So we are going to keep important information in more than one place. If you don’t find what you want to know – let us know! But it also may be found under our RESOURCES page. See also to search all blogs here.